When time is running out, one shot is all you get. In a world of blue skies, palm trees and dead bodies, a pair of detectives investigate the murder of a rap group while pursuing their other full-time professions. One's a real estate hustler, the other's a yoga teacher. Welcome to Hollywood Homicide - the only profession where a guy can come to work hungry, horny, thirsty and broke, and resolve all four by the end of watch. $11.112 million on 2840 screens. Take an aging but still popular hunk in Harrison Ford, pair him with an up-and-coming stud in Josh Hartnett, and what do you get? In the case of 2003’s Hollywood Homicide, a big stinking pile of nothing, at least when it came to the flick’s critical and box office reception. The film opens with a mass murder at a Hollywood nightclub called the Freeway. This leaves four members of an up-and-coming rap group dead. Detectives Joe Gavilan (Ford) and KC Calden (Hartnett) investigate. We also learn that our lead cops work side jobs. Gavilan struggles as a real estate agent saddled with an expensive property he can’t seem to unload. Calden teaches yoga and wants to become an actor, a sideline that leads him to feel police work may not be for him. Mostly the film follows the ways they track the killers, but it also spends much time on these sidelines. In addition, matters intensify when Internal Affairs investigates Gavilan. Another issue complicates that topic since Gavilan recently started to date Ruby the psychic (Lena Olin). 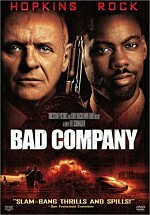 She dumped IA cop Bennie Macko (Bruce Greenwood), and he holds a grudge. As I watched Homicide, one question constantly came to mind: why does this film exist? It can never quite make up its mine if it wants to be a serious police drama or a comedic spoof. It serves two masters and satisfies neither. This causes the film’s main problems, along with the fact it comes across like a throwback to the Eighties. Unfortunately, I don’t mean that in a positive way. That era did the “odd couple” cop flick to death, and it did the genre better. Homicide presents absolutely nothing new or fresh to distinguish it from its predecessors, and it just seems pointless. The “jack of all trades” issue becomes a significant problem because neither side of the flick seems well executed. The cop stuff never even remotely creates an intriguing plot, and it doesn’t help that we know whodunit from early in the movie. There’s virtually no suspense or tension as we wait for the guys to solve the case; the audience is so far ahead of the players that the tale turns tedious. If the comedic elements presented something amusing, I might not mind the weakness of the story. Unfortunately, the film’s wackiness appears badly forced and moronic. Everyone has their nutty quirks, all of which comes across as contrived to an extreme. Add to that a series of tremendous coincidences and the movie becomes awfully silly awfully quickly. In addition, Homicide seems badly padded. The movie lasts nearly two hours but only includes enough plot for maybe half that length. Director Ron Shelton tacks on all those unsatisfying comedic bits to extend the running time, but these just make the movie even more tiresome. Maybe if the actors brought some spark to the piece it’d succeed, but that doesn’t happen either. Ford just seems tired as he sleepwalks through the part, and Hartnett can’t muster much personality for his role. The two present little chemistry as they punch the clock. Shelton made his name with sports flicks such as Bull Durham and Tin Cup, and maybe he needs to return to that well. He’s embraced the cop genre with Dark Blue and Hollywood Homicide, but he displays no aptitude for that field. Instead, he simply trades in clichés that grew old more than a decade ago, and Homicide seems like a dull and tedious exercise. 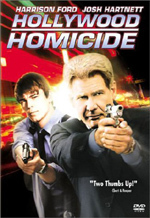 Hollywood Homicide appears in both an aspect ratio of approximately 2.40:1 and in a fullscreen version on this single-sided, double-layered DVD; the widescreen image has been enhanced for 16X9 televisions. Only the letterboxed picture was reviewed for this article. The movie presented a good image but not an exceptional one. Sharpness caused no problems. At all times, the movie remained nicely distinct and detailed. I witnessed no signs of softness of fuzziness. Jagged edges and moiré effects also failed to shop up, but a little light edge enhancement appeared on occasion. Print flaws looked absent, but I noticed a bit of artifacting. The movie presented a generally natural palette, and the DVD replicated the tones well. Colors came across as natural and tight. The hues were consistently vibrant and they suffered from no bleeding or other problems. Black levels looked clean and dense, while low-light shots were accurately rendered. Nothing terrible popped up during Hollywood Homicide, and the image mostly seemed solid. Hollywood Homicide featured a surprisingly positive Dolby Digital 5.1 soundtrack. The soundfield largely emphasized the forward channels, but it opened up nicely throughout the flick. The surrounds kicked in during various action scenes, and they particularly came to life when gunfire became involved; those elements used the discrete rear channels clearly and naturally. Music showed good stereo imaging and the front speakers maintained a nice sense of place and environment. Audio quality also came across well. Speech consistently sounded natural and crisp, and I noticed no signs of edginess or problems with intelligibility. Music was bright and lively, and the score and songs presented solid bass response. Effects also sounded clean and accurate. They showed good range and were well rendered. Overall, the soundtrack seemed satisfying. Only a few supplements show up on the DVD of Hollywood Homicide. The main attraction comes from an audio commentary with director/co-writer Ron Shelton. He provides a running, screen-specific chat. During this track, Shelton mostly does two things: narrate the film, and discuss how he feels he spoofs the buddy cop genre. Occasionally he tosses out a note or two about the actors or the locations, but not very often. Instead, he simply recounts the action on screen or pats himself on the back for his attempts to subvert the action genre. This makes for a dull commentary that gives us little information of value. The other extras seem bland as well. We find filmographies for Shelton plus co-writer Robert Souza and actors Ford and Hartnett. In the trailers section we get promos for Homicide plus Air Force One, Charlie’s Angels: Full Throttle, The Devil’s Own, Radio and The Missing. Maybe there’s still some life in the buddy cop genre, but Hollywood Homicide exposes nothing new or fresh. Instead, it comes across like a relic of the Eighties and it never threatens to turn into anything lively or engaging. It thinks it’s a clever spoof, but it falls flat as a parody as well. The DVD presents fairly good picture and sound, but it lacks substantial extras. I wanted to like Homicide but never could muster much interest in this lackluster dud.